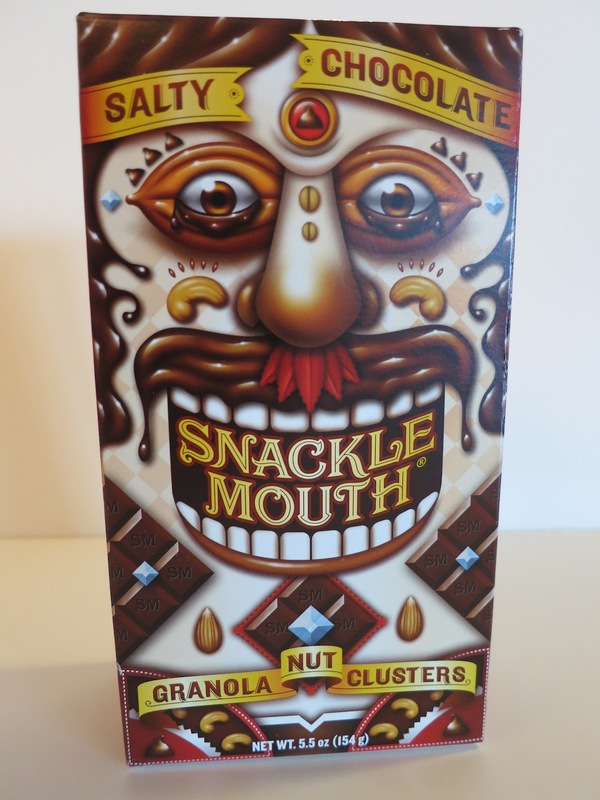 During the last food show I attended, I was handed a box of Snackle Mouth, a new granola snack made by Big Mouth Snack in Denver, Colorado. They were touting it as the vegan Cracker Jack. Well, we'll see about that. The first thing I noticed was its carnival-like packaging that made me think they were marketing this snack towards kids. But, when I tried it, I found it to be a very mature taste. These granola nut clusters were like no other I'd ever had. Packed with organic and all natural ingredients without any sugar or trans fats, this natural treat is a healthy alternative to some of the artificial products on the market. They originally came out with the three [vegan] flavors you see below, then added two new flavors, one of which was vegan. I had the pleasure of trying all four vegan flavors and loved them all. The first one I tried was the Peanut Cranberry. This one is made with dry roasted peanuts, oats, almonds, and dried cranberries. I was delicious, but I really felt like it needed more peanuts. The second one I tried was the Almond Maple Pecan made with almonds, oats, pecans, raisins, and cranberries. You could smell the sweet maple scent as soon as you opened the box. Loved this one. Next, I tried the Almond Berry made with almonds, oats, dried cranberries, and dried blueberries. Lastly, I had their new one - the Salty Chocolate made with almonds, chocolate, oats, and cashews. This flavor was by far my favorite. The chocolate and sea salt paired well with the almonds and cashews and I enjoyed the flavors. I think the cashews were a great addition to this flavor. In all of them you get a sweet taste from the blue agave and brown rice syrup, all-natural sweetners. To even compare this to Cracker Jack is an insult to Snackle Mouth as it is far more nutritious and better tasting! I'm excited to see a new player in the granola market and hope to be able to find these locally soon! I found these at my local Bealls Outlet. They had the Maple and Berry flavor available for $2.99 each. They were both fantastic, but my favorite is the Maple Pecan. Looking forward to trying the others as well. Awesome! I love them too!